Do you have a creepy beaded Halloween scene? If you do, you need a suitable creepy Halloween tree! 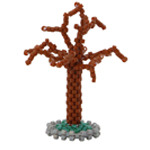 Made using Round Peyote and Even Count Peyote each Tree takes around 20-30 minutes to bead. As usual with ThreadABead featured patterns we give full detailed photographic instructions and in this pattern there are 41 detailed steps, making this pattern even suitable for beginners to beading. Please note the pattern may not work with any other size and type of beads. There are 3 colours in total and the finished beadwork is approximately 2.75cm (w) x 2.75cm (d) x 4.5 (h) cm The bead pattern supplied is 12 pages and includes full colour photo instructions and a coloured pattern chart where needed.